Vang Vieng (population about 25,000) is located in central southern Laos about a 4 hour bus ride north of the capital city of Vientiane or about 7 hours south of the town of Luang Prabang. If you enter Vang Vieng by bus you will be dropped off on a huge gravel runway on the edge of town. A brisk several minute walk across the runway will bring you to the main part of town. Signs for guesthouses or restaurants call out from almost every single building. You know you are in Vang Vieng when you see the dull rusted corrugated metal roofs of the buildings in stark contrast to the brightly colored 3 wheel Tuk-tuks lined up along the streets. This is a truly a backpackers city – businesses that cater to backpackers are everywhere. Internet cafes, guesthouses, bars, massage parlors & trekking companies all greet your arrival with welcoming arms. These are all fairly new establishments as backpackers haven’t always stayed in Vang Vieng. 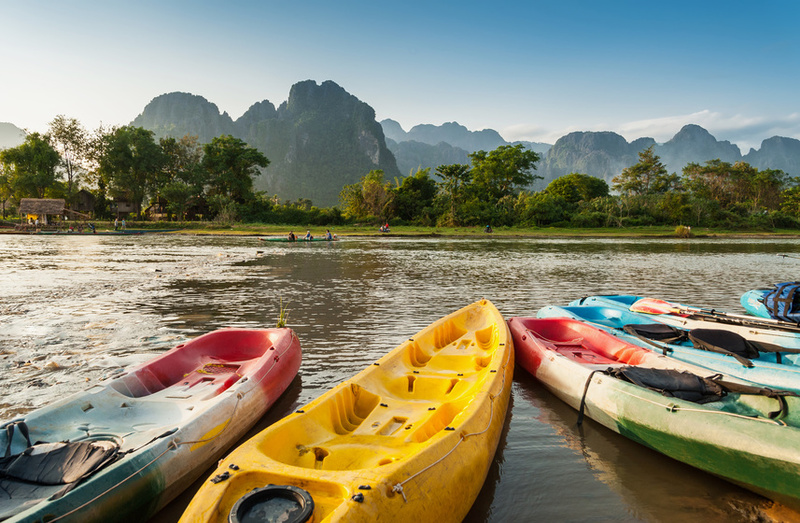 It is only within the past 5 or 6 years that Vang Vieng has seen such an influx of tourists. There are people here from all over the world – you can’t help but meet travelers! 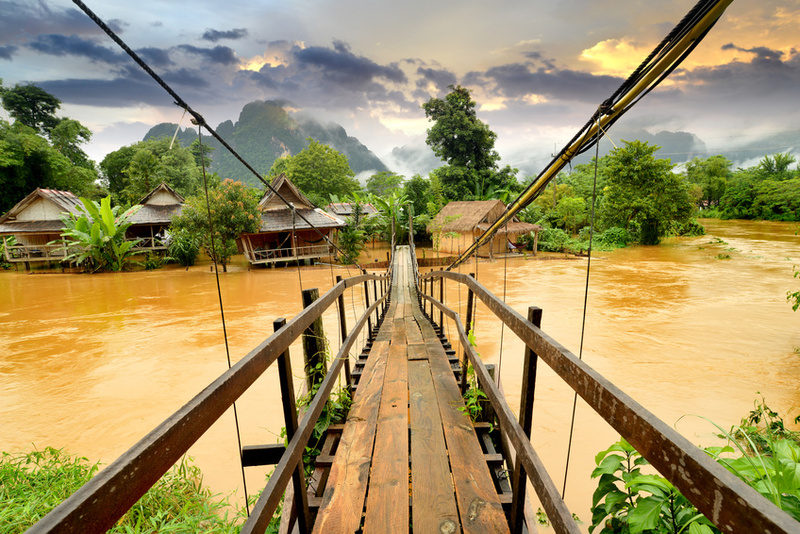 Vang Vieng is set along the banks of the Nam Song River. In the near distance towering behind Vang Vieng are the most incredible rock formations. They are jagged limestone karsts that tower above the jungle – steep walls which have somehow eluded the jungle’s grasp. I really like the 2 pictures on your website. The one with the hanging bridge over the river. Do you have this picture in hight resolution? I would love to make a wall wrap in My Office with this picture if you want to share it? Ivo – thanks – I took most of the photos on this site, but not those two – for some of my older articles I used some photos from photographers licensing their works. Unfortunately those are the largest resolutions I have.